Frontline politician in India. He is a Member of Parliament - Rajya Sabha and General Secretary, Indian National Congress, the lead partner in the United Progressive Alliance. Greetings, friends! Mr. Singh will start responding to questions on May 8th @ 8:00 PM. Please feel to post your questions/messages and our moderators will keep tracking them. 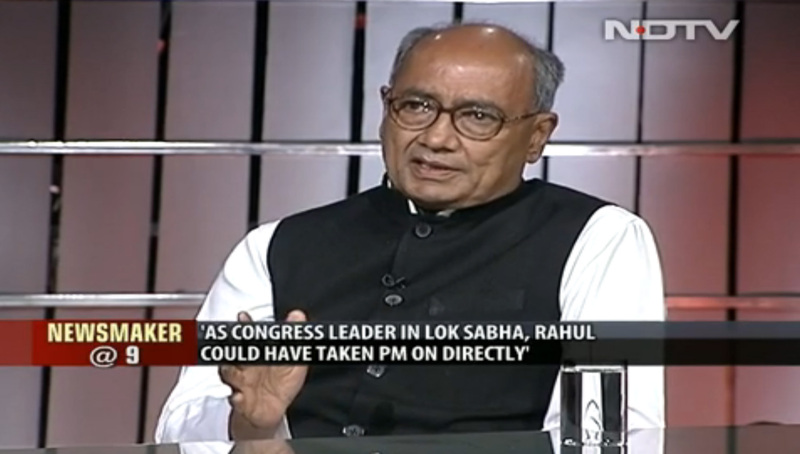 Welcome to the SaddaHaq Townhall Mr Digvijay Singh. Our readers have many questions for you this evening. Mr Singh, as all of you know, is one of the senior most Congress leaders today. Your questions are now live. Hello sir! There are many young and educated youth who want to join politics not as a politician but as a back-room strategist. They would love to become loyal followers as working in the background is there forte. Is there a place for people with such ambitions? Mr Singh do you honestly feel that Rahul Gandhi can be the face of Congress in the future? Because he is not a mass leader like Mrs Indira Gandhi nor he is not charismatic as his father Mr Rajiv Gandhi? The way Rahul Gandhi answered in Arnab's questions last year makes whole of India think Rahul is an obtuse person. Is it the high to stop Dynasty politics and project other efficient and capable leaders in Congress or nurture other young leaders ? if you go back in history Mrs Indira gandhi was called a gungi gudiya but later on she proved her leadership. it is a question of opportunity given an opportunity Im sure mr. Rahul Gandhi shall prove to be a leader and a statesman who can lead this country. A day after Rahul Gandhi returned from sabbatical, you had said, "Old leaves fall, new ones grow. Time for our retirement has come. It is the era of youthl." How ready is Rahul Gandhi, and for how long will his new-found energy last? Given the kind of ideal politics he demonstrated(of course not so actively though) in later half of UPA-II. Why don't the 'elders' in congress not giving him a free run to try his ideal politics? Given the strong structures at the base levels INC revive it self quickly and thoroughly re-emerge with youthful energy. What is your say on this? I totally agree with you and I have been saying this for a long time. Sir, being SR, citizen I have seen congress from Sri,Neharu to today congress. Sir, There some thing wrong in handling congress for poor n poor show so is not the need of time to demolition old house n built new House what people need.? Pl, your expert comment is it need or not? politics is an art of the possible. Every political party has to change and adapt itself and its policy which the people of the country demand the emerging middle class in India has their own aspirations and the views of the emerging youth middle class has to be understood and suitably Congress party has to come out with policies and programs which attract the emerging young generation of middle class, yet we cannot ignore the poor and the deprived sections of the society living in remote inaccessible areas. Mr. rahul Gandhi has held discussions with senior leaders and on basis of which a background paper was prepared which was given to the general secretaries of the AICC to be discussed with state and district level leaders. On basis of this the Congress President shall prepare the road map which would be put up to the working committee and then discussed and adopted by the All India Congress Committee. Dear Sir, What are your views in children of Politicians being in politics? Don't you think they do have certain experiences which can actually be useful in people interaction and governance practices as compared to a movie star or sportsperson jumping into electoral politics with no experience? Every citizen in India has a right to choose his own field of activity and if the children of politicians decide to choose to be in public life they have every right to do so. The Congress Party had been in power in this country for the last six decades. Even to day It's slogan is "Garibi Hatao" because there is still rampant poverty.During this period your party men have become Billionaires. You have been using the poor of this country as your vote bank as you have been using caste & communal vote banks. In short you have been fooling the people all these years.How do you Congressmen expect the people to bring you back to power? Why not give a chance to Modi? Having failed as a ruling party you are now abysmal as an opposition party also trying to derail all the developmental projects. Are you not mean minded? You are forgetting that it is only because of the right policies of the Congress party india has become one of the fastest growing economy in the world. Our poverty levels have come down and those who were below poverty line and belong to the underprivileged sections have moved up the ladder and are in the middle class. What these sections need is an opportunity which the Congress party provided through reservation as provided in the Indian Constitution authored by Babasaheb Ambedkar. We do not subscribe to any vote bank politics and frankly there is no such thing as vote bank in todays politics. Every citizen has an independent opinion and sometimes there is a difference of opinion in the family also let us not forget that it is the leadership of Pandit Jawaharlal Nehru to Lalbahadur Shastri to Indira Gandhi who through right policies guided the Indian destiny which has brought to a stage where India is being recognised as a world power. Mr. modi criticises the 60 year rule of the Congress party but when he goes abroad he claims to be the prime minister of the fastest growing country in the world which itself is contradictory if the Congress had done so badly in the last 60 years is it because of less than 1 year rule of Mr. Modi which has put India on the world map. The Congress Party shall play the role of a constructive responsible opposition party in the country the role which the people have mandated for Congress in the last parliament poll. Despite having more spokespersons than MPs, the Congress spokespersons cut a sorry figure on television debates. Why aren't the most eloquent of speakers being made spokespersons? We have purposely chosen young bright people as spokespersons who can develop over the years through experience. the Congress party has always believed in promoting youth leadership. Why is it that Arun Shourie did a better job at being the government's critic, than any of the opposition parties, including the Congress? It is because when criticism comes from within the party it has more credibility. Do you agree to the fact that corruption in government has gone down in BJP regime as compared to the miserable status in UPA's time? What is congress doing to bring transparency in the party ? Congress Party has always believed in transparency and it is only because of Mrs. Sonia Gandhi who brought in the Right to Information Act which has led to the exposure of maximum cases of corruption in government. The present government wants to undo the transparency which came through RTI which they want to amend to suit themselves and the government officials. I have always strongly believed in fair and impartial organisational elections and I support fair and impartial elections in the organisational set up of the Congress party. We could not empower the elected NSUI and youth congress office bearers to expand their organisations and also there was no coordination of these organisations with the parent body which led to a situation where the whole organisation did not act in a homogeneous manner. these are the issues which the Congress president and vice president would have to look at so that the whole organisation works as one team rather than a fragmented organisation. How is the Congress reshaping its strategy in Parliament? Is it by cornering the government on key bills in Rajya Sabha? I would like to convey that the Congress party does not want to act as a road block in the Rajya Sabha and we strongly believe that every new bill should go to either a Standing Committee or a Select Committee for legislative scrutiny which is absolutely essential in parliamentary democracy. The BJP govt. wants to bulldoze bills which have reaching impact and which affect the lives of common man as it has happened in the case of Land Acquisition Bill which has taken away the rights of the farmers. Where was the need for an Ordinance. No political party would like to take away the rights of the farmers and if the BJP government wanted to amend the Land Acquisition Act they should have called an all party meeting or should have referred it to a Select Committee of the parliament as it was done by the UPA.